As you can see, the rice in Cauliflower Fried "Rice" is in quote. This tells you that it is not actually rice as in, the starchy staple food. In Cauliflower Fried "Rice", cauliflower is "riced" in other words, grated or chopped to look and feel like rice grains. This rice feel and look makes you think you are eating rice but it's actually cauliflower. So healthy. Thanks to Cauliflower Fried "Rice" those on a low carb diet will no longer miss the classic Fried Rice dish. Ingredients for Cauliflower Fried "Rice"
I enjoy preparing this with carrot oil because the beta carotene in it helps keep me young. 😉 You can fry the ingredients with any keto-friendly oil (coconut oil, extra virgin olive oil) if you are on a strict keto-diet. 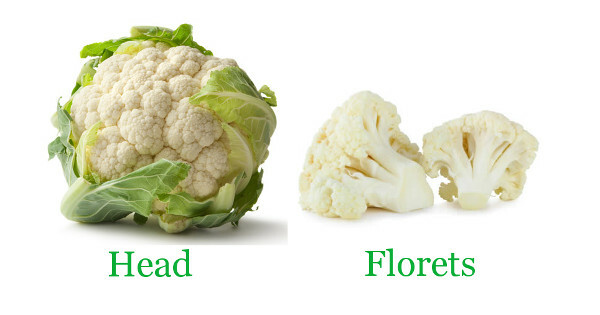 Cauliflower is a vegetable, you can buy it in very big supermarkets in Nigeria. Oregano and cumin are seasonings like thyme and curry powder and they are also available in very big supermarkets in Nigeria. You only need very small quantities of green, red and yellow pepper. Please see the video below to see the quantities I used, they are not up to half of 1 pepper. Red and yellow bell peppers are available in big supermarkets in Nigeria. Wash all the vegetables before you start. Before you prepare Cauliflower Fried "Rice"
"Rice" the cauliflower by grating it with a hand grater. You can also use a food processor to gently chop it but be careful because if you run the food processor for too long, the cauliflower will become mushy instead of like rice grains. Chop half of the onion into tiny pieces and the other half into bigger pieces. 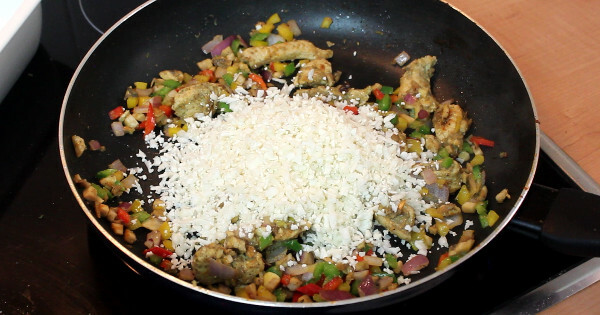 Chop the mushroom, garlic, red, green and yellow bell pepper into tiny pieces. Grind the oregano, thyme, cumin and black pepper with a dry mill or spice grinder. Blend the garlic and the half of the onion that you cut into tiny pieces. Cut the chicken breast into short thin stripes. See video below. Directions for Preparing the Cauliflower Fried "Rice"
Place the chicken into a bowl. Add the garlic and onion blend, the blend of seasonings and mix till everything is well incorporated. Cover the bowl with a plastic film and place in the fridge for at least 1 hour to marinate. After one hour, steam the chicken in a pot/frying pan without adding water or oil. Stir all the time so it will cook evenly. Dry fry for about 5 minutes or till each piece of chicken breast is pale all over. Remove from the pot/pan and set aside. Heat a tiny amount of the carrot oil in a frying pan or wok. When hot, add 1/3 of the chicken and stir till you see some browning on the sides of the chicken. Add 1/3 of the diced mushrooms, fry for 1 minute. Add 1/3 each of the diced onions, green, yellow and red peppers. Stir-fry for 1 minute. Add 1/3 of the “riced” cauliflower. Stir-fry for about 1 minute. Add salt if necessary and pour out to a bowl, pot or casserole. Repeat the process for the remaining batches of ingredients. That's it! It is so tasty! You can have Cauliflower Fried "Rice" as a meal on its own because it's quite filling. I serve it as a side dish when I don't want to serve Nigerian Salad. Watch the video below for the recipe.